If you’ve been reading my blog for a while, you know I’m always keeping an eye out for makeup products to try. And, if you’re new to my blog and don’t know me too well; welcome! Good to have you. 🙂 Okay, so this weekend I went to Sephora to pick up a lip product or two. My trusty Colourpop lippies are finally starting to run out, and I was in dire need of something to replace them with. 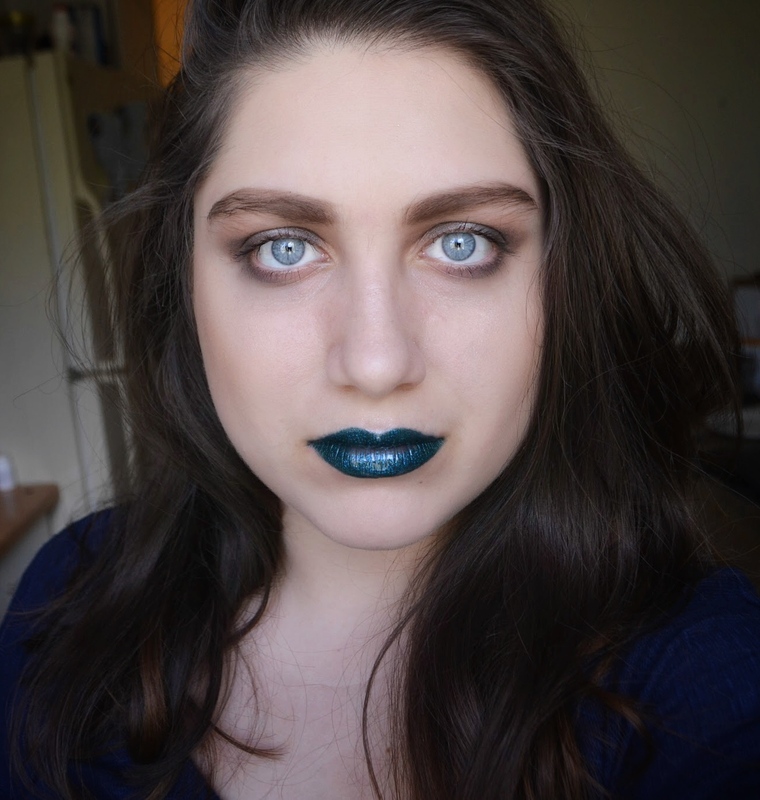 Once in Sephora, I was heading towards the Smashbox liquid lipsticks – but decided last minute to just stick with products from the Sephora collection. You know, to save money and all that. Now, I’ll admit – I’ve never bought anything from the Sephora Collection before. In fact, I’ve never even glanced through their products. Usually in Sephora, I get distracted by Too Faced, Tarte, and all the expensive things they put in the front of the store, and then head straight to the checkout so I don’t spend even more money. Well, this was the beautiful sight I was met with in the Sephora Collection section, and I was in HEAVEN. Bright, beautiful colors popping out at me and calling my name, and at an affordable price. I picked out one shade of each product, and had two of those products turned into free samples. I couldn’t wait to go home and try them out! Let’s see how that went. I love, love, love, this product. It’s so highly pigmented, and this particular shade is gorgeous. Kind of a coraly-brown, with light gold flecks in it. It also has the perfect amount of shine – enough to be playful and pretty, but not overboard. The applicator is also very nice, and makes it easy to apply. The color and shine lasts for a long time too; there’s no need to be constantly reapplying. The one downside to this product is probably the smell; it’s quite sweet. Then again, I suppose a lot of people might enjoy smelling like buttercream. I wanted to love this product – I really did. The name of the shade is great, the gloss looks like a gorgeous plum color, and the packaging is super cute. Unfortunately, none of it’s beautiful color translated onto my lips. I added layer after layer, but I just couldn’t get even a slight tint of purple to show up. It does a great job of being glossy, and it isn’t sticky at all. I just don’t think they should have put “colorful” in the name, when it goes on clear. This lip oil is so moisturizing, and I think I’m going to incorporate it into my daily skin routine. Goodness knows, my lips need it. It has a light sheen of color, and made my lips feel so silky smooth. This would be perfect for a barely-there makeup look. Love it, and would definitely repurchase. The picture of the packaging looks a little wonky; I received a sample of this, so I had to take the picture in Sephora lighting. Anyways, this is probably my favorite product of the bunch! It looks very similar to the ColourPop Magic Wand lippie that I’ve finally run out of. The formula is smooth and creamy, and it’s definitely hard to budge. I had the hardest time washing of the swatch! I just love everything about this product, and will definitely be purchasing more after my sample runs out. This was the last product I tried on, as I wanted to test if it was truly “long-lasting”. And, it is! Several hours later, and I have not had to touch it up. The color is gorgeous – the perfect red lip. Just a note: do not expect this to be true matte. It has moisture, and a light sheen. However, this means it does not dry out your lips like many matte liquid lipsticks do. lovely review! I’ve always wondered if the sephora line was any good. I may have to check out some of their stuff! This makes me want to head down to Sephora immediately. Yesss! I have the NYX matte lip cream in purple and brown, and they are gorgeous. They really are, what’s your favorite shade? This is great. I always get so disoriented at Saphora. It makes me really happy to see all these Sephora photos. I live in the Netherlands. There’s no Sephora here anymore. And I really miss it. Luckily I’m going on holiday to Poland soon and I saw there’s a Sephora! Oooh, grab what you can while you’re there! I feel the same way about Lush; there’s none near where I live, but they were in every city I visited in Europe this summer.